This is the week of chicken! Meaning . . . I’m posting the second chicken recipe of the week. So, two recipes. Never mind. 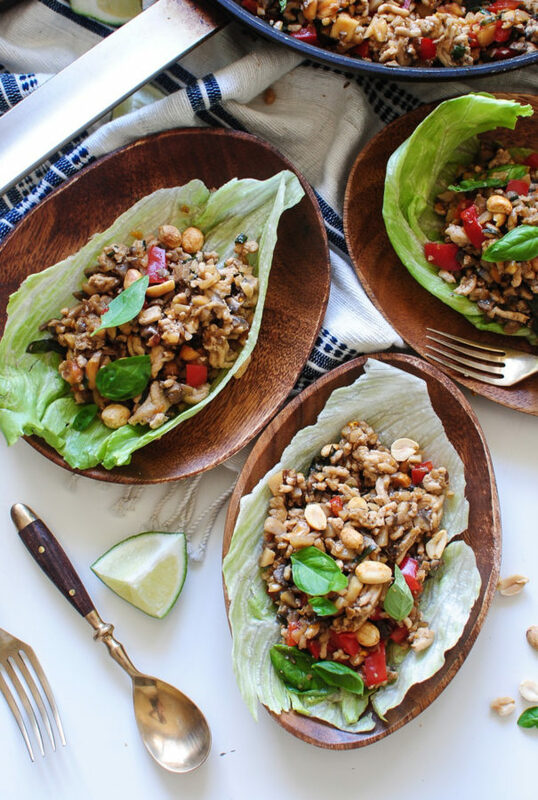 Just how in love with lettuce wraps are you? But do you know what I mean? Once all the chopping and prepping are done, which is 95% of the legwork, and you fold that lettuce wrap just so gently, tilt your head to the left at a 45 degree angle, mouth opens wide, aaaaaand BOOM. Lettuce wrap glory explosion. Why are they so good!? This ^^^ is probably why. Can we just look at all that goes into these pups? 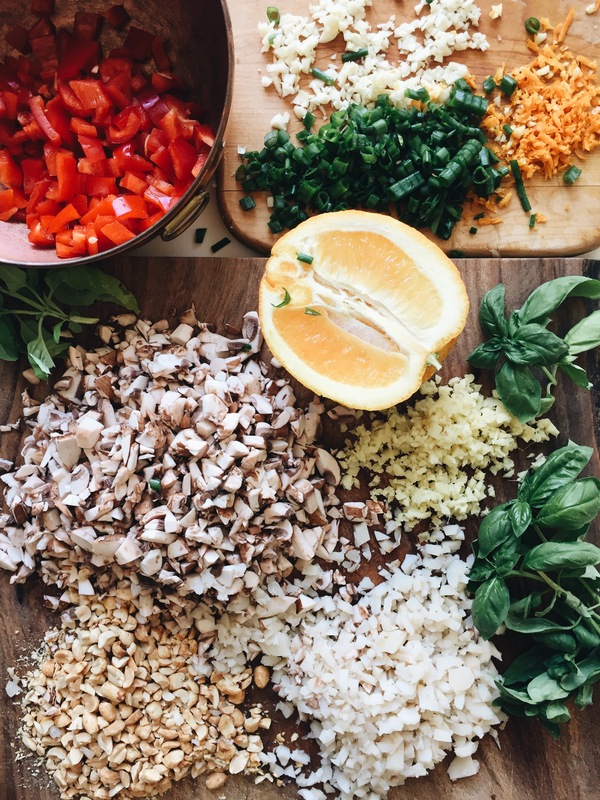 We’ve got finely diced baby bellas, lots of garlic, lots of ginger, diced red bell pepper, water chestnuts (! ), orange zest (double ! ), orange JUICE, peanuts galore, basil like whoa, and scallions. And that’s just what’s in this photo. You’re also going to have ground chicken, coated in a velvety sea of hoisin sauce and orange juice. And lime juice! It’s the season for awesome, I do believe. Also, I’m trying to eat less carbs. Which is the saddest thing in the entire world. But, I have a fancy ladies’ trip to Cabo in one month and my running can only take me so far, yo. So! 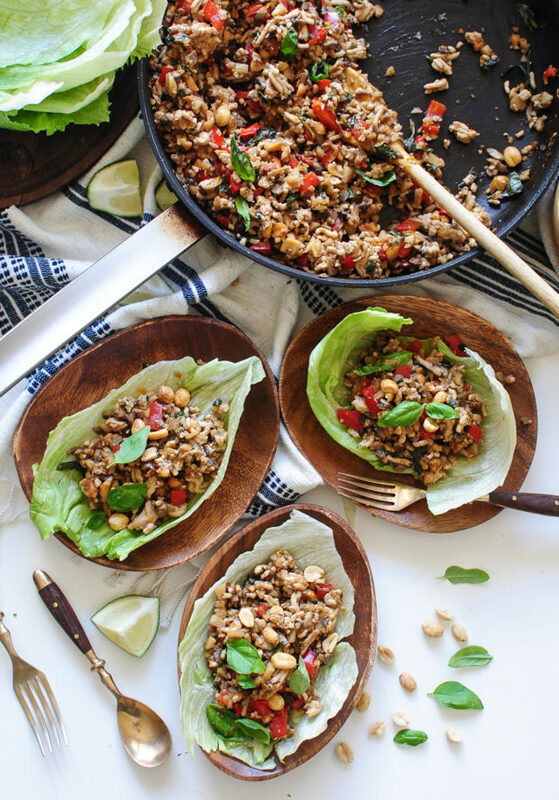 I’ll eat lettuce wraps every single day and night until then. SET IT STONE. These are suuuper supppper superrrrrr tasty. I added a ton of basil to mimic a local restaurant’s creation, and the moment I did, the angels of my heart got dizzy and flew into a window. I’ll be adding basil from now on, in other words. The filling takes only takes a few minutes to cook. The longest part is getting everything all diced up. (This is why there’s wine in life.) You want it as small as you can get it, so that it looks like a restaurant and your self esteem high fives itself. As far as lettuce, feel free to swap out iceberg for a softer leaf, like Boston or Bibb. I happen to prefer that satisfying crunch of iceberg. Plus it reminds me of Titanic, so. JACK. JAAACK. COME BACK. JAAAACK. COME BAAAACK. 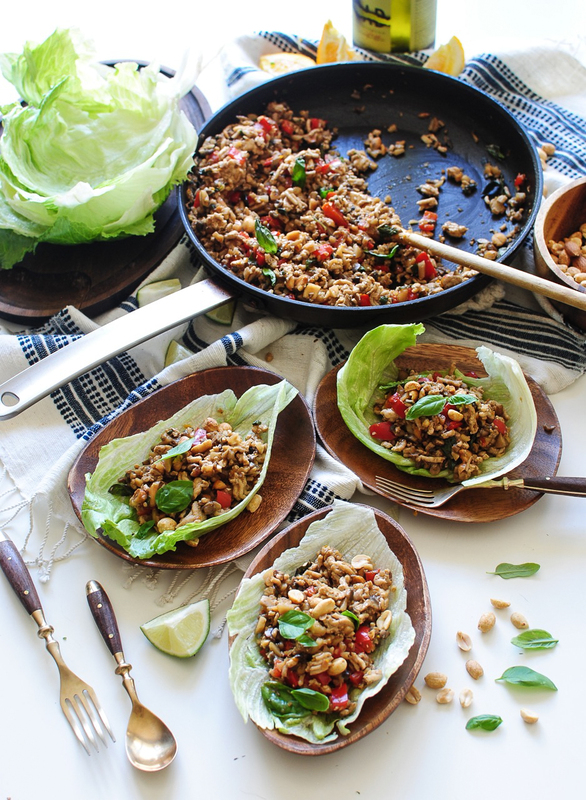 Make yourself some lettuce wraps, already. Once everything is prepped, and you're on your second glass of white wine, heat a large skillet over medium-high. Add the ground chicken and cook, breaking up with a wooden spoon, until no longer pink. Add all the vegetables, and sauté for a few minutes, until they begin to soften. Stir in the hoisin sauce, orange juice, zest and lime juice, the peanuts, scallions and basil. Sauté another couple of minutes, until things taste just right. Add a good pinch of salt and pepper. Taste that. We good? Yes, we are. 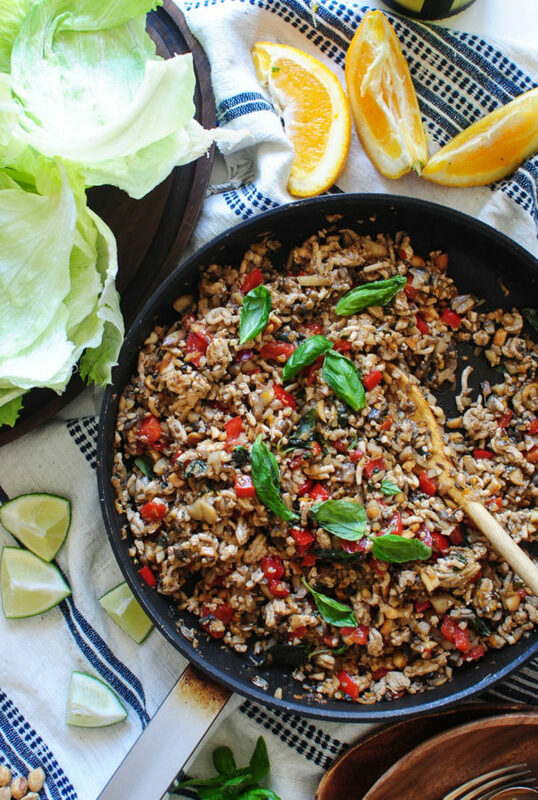 Spoon the filling into each iceberg leaf, garnish with a little more basil, and get to shoveling! It’s okay to eat seven of these in a row, right? Eight? Have fun in Cabo! I live in Todos Santos. It's a small artist and foodie community 1 hour North. Come for a visit if you get a chance! I made these last night and they were incredibly delicious. I brought in the leftovers to work for my coworkers to try and ended up emailing the recipe to several other people. Once the chopping was over the recipe was a breeze. I may try it on zucchini noodles next! Oh man!! These look/sound amaaaazing!! 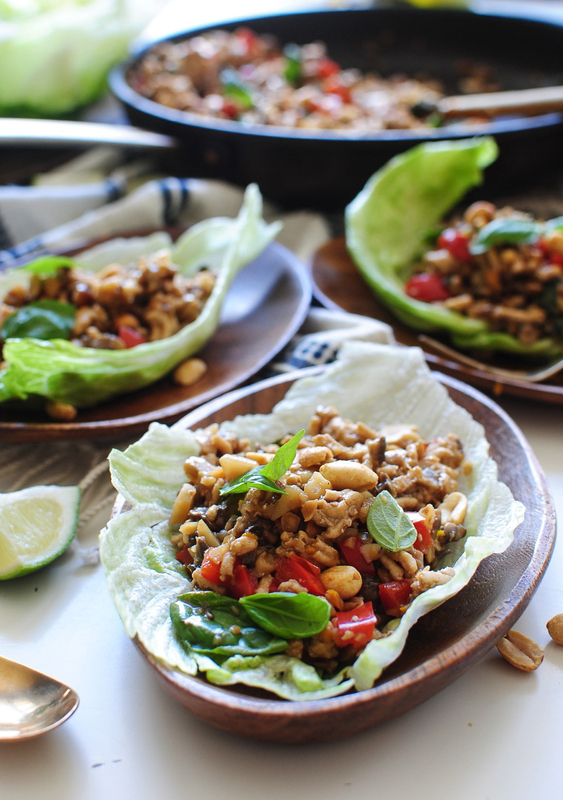 We LOVE lettuce wraps and I'm gonna have to try these soon!! I'm so loving that picture of all the diced veggies! Beautiful!! Made these too and they were delicious!